Conceived by Fluxus artist Wolf Vostell (1932–1998) as an “instant happening” and an “event sculpture,” Concrete Traffic was commissioned by the Museum of Contemporary Art Chicago (MCA). 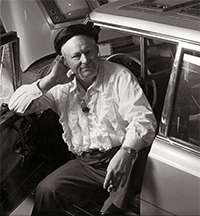 On the morning of January 16, 1970, in a busy Chicago commuter parking lot, Chicago artisans brought Vostell’s vision to life, pouring concrete over a 1957 Cadillac deVille to create the monumental concrete sculpture. Concrete Traffic spent several months in the lot until the artist and the MCA gifted the sculpture to the University of Chicago, where it was sited in an outdoor lot at 60th Street and South Ingleside Avenue—the current site of the Reva and David Logan Center for the Arts. Concrete Traffic spent nearly 40 years exposed to the elements, until a major four-year conservation effort was undertaken between June 2012 and September 2016, complemented by material investigation and a series of workshops. (For more information about these efforts, visit neubauercollegium.uchicago.edu). As this work came to a close, a partnership of UChicago arts organizations envisioned Concrete Happenings. Fluxus is a loosely-defined global, performance-based, avant-garde art movement. Associated artists such as Wolf Vostell, Joseph Beuys, Allan Kaprow, and Yoko Ono sought to involve viewers in the creation of art, rather than the result. As Fluxus works most often took the form of events or happenings that viewers experienced merely by chance, the movement is typically represented by ephemeral artifacts such as fliers, photographs, and film documents. Wolf Vostell (1932–1998) was a German artist best known for video art and installations involving televisions, automobiles, and other household objects. Concrete Traffic marks a shift in his practice from generating accidental happening fallouts to producing conceptually designed formal sculptures.